Often, when we first think of ‘outsider’ art, we imagine 2D paintings or collages made from recycled materials, rather than fantastical landscapes and installations in the wild. Visionary environments are huge scale artistic projects that are inbued with a sense of personal involvement and subjectivity; two characteristics which result in these dreamlike spaces being most closely associated with the work of ‘outsider’ artists. 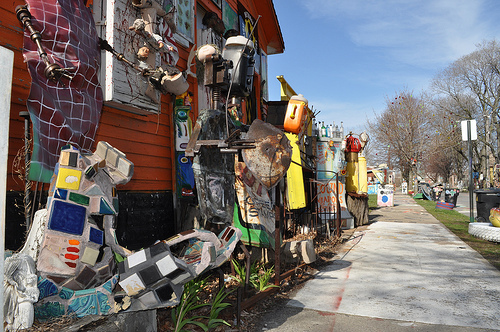 Some of the greatest work ever attributed to ‘outsider’ artists has been in the form of these visionary environments. These projects often take the artist years – or occassionally a lifetime – to complete; often becoming an obsession or an extreme compulsion. 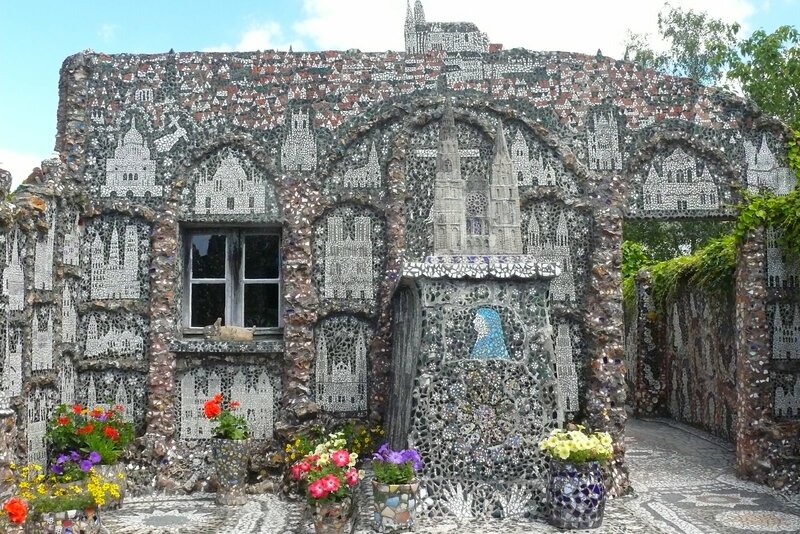 La Maison Picassiette located in Saint-Cheron, Chartres, France, is a mosaic-ed house created by Raymond Isidore (1900 – 1964). The house was built by Isidore himself, and then covered in broken pieces of china and crockery – a hobby which soon escalated into an obsession. Eventually, Isidore covered the interior of the house as well as the outside walls and the garden. After completing the mosaicing of the house, Isidore added a courtyard and a tiny chapel to his original house – these, of course, were decorated in the same way. Isidore died of exhaustion just two years after completing his increasingly all consuming project. In the UK, Kevin Duffy (b. 1945) has spent the last 31 years creating Tudor Village in North Ashton, Lancashire. Duffy is fascinated by traditional British vernacular architecture – but far from providing a purpose such as shelter, Tudor Village’s purpose is predominantly to satisfy his own need to create. More like stage sets, the buildings that the site encompasses are mainly facades – they have no interior. 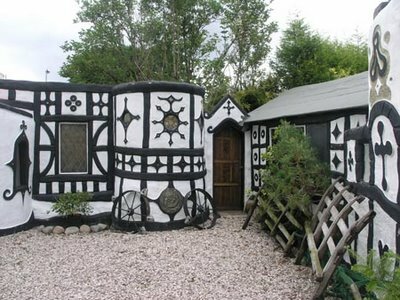 The site itself is a garden centre – but it is not a garden centre in the commercial sense; its main purpose is to provide an income for Duffy’s creations and to allow him the time and money to keep building. Duffy hopes to continue adding to the work and sees it as a lifelong commitment. Many of these visionary environments are abandoned once their creators pass away. This inevitably leads to their delapidation and decay. There is also the question as to whether the public should have access to these secret and extremely personal open-air environments. This is true in the case of John Fairnington, who created a ‘fantastical’ garden for his disabled son Edwin. The garden, known as the Cement Menagerie, contains approximately 300 animal sculptures. Fairnington left the garden to charity, but his son John bought it back to open it to the public. Similarly, Kevin Duffy enjoys receiving visitors at Tudor Village and encourages people to visit whenever they can.